Among the activities we’re initiating with our Sports Media & Analytics Program at Virginia Tech is getting our young journalists in newsrooms and TV studios throughout the region. We recently brought a group of our aspiring broadcasters to WVVA-TV in Bluefield, Virginia to tour the station, see a live newscast from the control room and studio, and then visit with talent, management, and technical staff from the station. Four of our Virginia Tech students were interviewed live during the station’s noon news program. When we can bring a group of students to a station, it serves two purposes: First, it allows them to see that the various principals they’re learning from the faculty at Tech are the same that the professionals in the ‘real world’ are living each day. They get exposed to pro’s who are eager to help younger broadcasters along the way. And secondly, it allows management at those stations to meet our kids and see first-hand the program we’re developing in our studios at the Moss Arts Center. Special thanks to WVVA-TV Vice President and General Manager Frank Brady, News Director Ken White, and Promotion Manager Heather Webb for their tremendous hospitality and insight during our group’s visit. Below are a few other pictures from the group's visit to WVVA-TV. WVVA-TV News Director Ken White walks through the noon news from the station's control room. Virginia Tech students visit with WVVA-TV meteorologist Katherine Thompson on the group's recent visit to WVVA-TV. Katherine is a 2014 N.C. State graduate who, in addition to her degree in meteorology, also holds a B.A. degree in History. She provided terrific insight for our group. 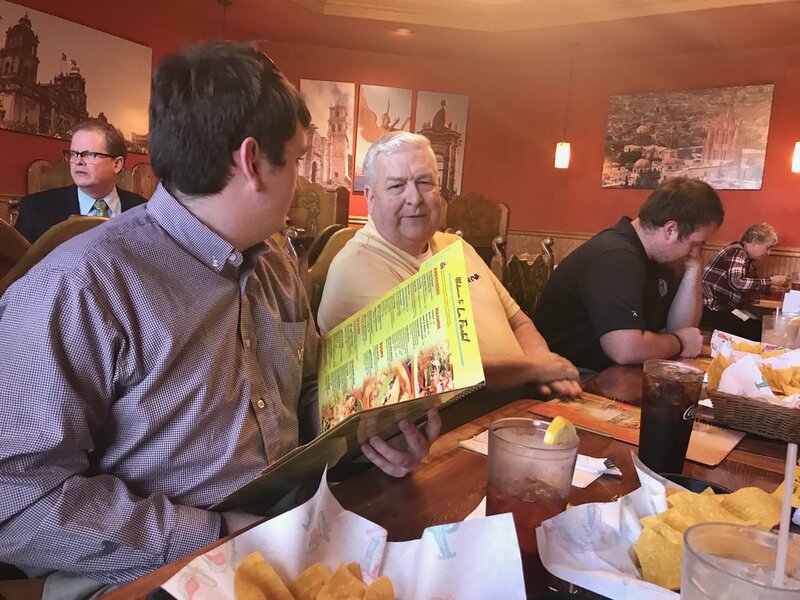 Virginia Tech journalist Trey Lyle visits with WVVA-TV Vice-President and General Manager Frank Brady at lunch following the group's recent visit to the Bluefield television station. PK's Back to School: PK's in Blacksburg will be highlighting the work being done by Virginia Tech students in the SMA program. Now celebrating 25 years of operation, PK's serves delicious food including its famous hot wings and pizza. Located right across from the Virginia Tech campus, PK’s provides a unique social environment where the town and the college meet. Click on the PK's Logo to learn more about one of Blacksburg's great traditions.